After 2016’s record-setting sales and resale home prices, and an almost decade-high record for new housing starts, Ontario’s red-hot real estate market will begin to cool in 2017. Slow job growth, deteriorating affordability and fewer households being formed are among the influencing factors, not to mention new government rules that tighten criteria for borrowers of insured mortgages. But the news is not all negative. While home prices won’t increase at the same rate they have been, they aren’t expected to drop and will continue to grow marginally in many Ontario markets. Ted Tsiakopoulos, Canada Mortgage and Housing Corp. regional economist for Ontario, forecasts housing starts in the province will taper off over the next two years. “When we look ahead, we are obviously talking about moderation,” Tsiakopoulos cautions. Single-detached starts will slow in 2017 and drop further in 2018. But multi-unit starts should increase slightly next year. On the existing home front, independent housing analyst Will Dunning expects sales of resale homes and new houses to drop. He foresees a slight drop in low-rise new home starts and a jump in the number of GTA condo starts. Pricewise? In 2016, the average MLS price in Ontario was expected to range between $420,000 and $466,000. That range is expected to move slightly higher in 2017. Ontario is Canada’s export leader and trade accounts for a significant portion of the province’s Gross Domestic Product. If the Canadian dollar climbs higher (making Ontario goods less attractive to our trade partners) and oil prices increase, the province’s growth may slow. And when the economy slows, that affects another factor influencing the housing market: job growth, says Tsiakopoulos. Job growth in Ontario is forecast to increase by a modest 1.2% in 2017 and 1.0% in 2018, Tsiakopoulos says, down from 1.3% in 2016 and down from an annual average of 1.7% during the pre-recession period (before 2008). Affordability is a third factor that could impact the market, says Tsiakopoulos. It’s eroding and, coupled with the new mortgage rules, that’s going to affect first-time buyers’ ability to afford a home. Fewer households are also being formed. The annual household formation count in Ontario has averaged 67,000 households a year in the past three census periods (2001 to 2011). CMHC estimates that an average of 65,000 households a year have formed from 2011 to 2016. Invariably, many young adults who are potential first-time buyers are opting to continue living with parents or sharing accommodation with others. The federal government’s new rules governing insured mortgage lending will also make it more difficult for first-time buyers to get into the housing market. Don Campbell, senior economist for the Real Estate Investment Network, gives this example of a family with a household income of $100,000 and a down payment of $40,000. Under the old rules, they’d have qualified to buy a $665,000 home. Now, they can qualify to buy one worth $505,000—in a market where prices are accelerating. Dunning says the substantial condo investment sector in the GTA could be the big story. “It likely will be reduced. There is a lot of housing under construction and we will continue to see new rental condos for a while (those condos bought by investors for the purpose of renting out). But by 2019, it will fall off and it’s going to be harder to get financing. If the market is negatively affected, investors will be more cautious about buying something. Tsiakopoulos says as the policy is new, it’s difficult to evaluate its impact on the housing market. Buyers who don’t pass the new stress test could come up with a higher down payment by borrowing from alternative sources, such as family, settle for lower-priced homes or delay buying altogether. CMHC identified Hamilton and Toronto as two markets with strong evidence of problematic conditions and overvaluation, and price acceleration is spreading to neighbouring communities. Dunning says overbuilding is not a problem in Toronto, however. In fact, it’s the opposite problem. The GTA will continue to suffer from lack of supply, and inventory as of early November 2016 was less than 2,000 units, according to Dunning, with provincial policies limiting the supply of serviced land for development. Immigration continues to be a key driver of that increasing Ontario population and accompanying demand. About 300,000 immigrants arrived in Canada in 2016, with most settling in Ontario—mainly in the Toronto area. According to CMHC’s fourth quarter Housing Market Outlook report, net migration to Ontario will rise to more than 118,600 people by 2018, up from 96,000 in 2015. Tsiakopoulos agrees there will be a dampening of sales activity, but prices won’t decline. The only way that would happen is the evolution of a buyers’ market happens, and that doesn’t appear likely for some time. Don Campbell, a founder and senior analyst for the Real Estate Investment Network, sees areas outside the GTA that have attractive lifestyles as doing well. Brantford (between the hot markets of Hamilton and the Kitchener-Waterloo-Cambridge technology triangle), Barrie and Orillia (where Hydro One has acquired Orillia Power Distribution Corp. and will construct new facilities) are good bets. And the extension of Highway 407 has been “a game-changer” for Durham Region, Campbell says, since it reduces commuting times to Toronto and other areas of the GTA. While factors such as new mortgage rules and housing supply issues may be putting a damper on the new housing market, there’s still opportunity. The three Rs that were solid performers in 2016—resale, renovation and rental—continue to offer promise in 2017, along with an M, for mortgage lending. Tsiakopoulos expects the resale market to hold up well in 2017, given that new housing starts are easing and resale homes are more affordable. Renovation spending will continue to grow. In 2015, it was a $25-billion industry in the province, and CMHC expects reno spending to advance to between $25 billion and $27 billion in each of the next two years. Renovations will be especially popular among homeowners in the 55- to 64-year-old age bracket, he says. Many prefer to renovate their current home to suit their needs, rather than pay a realtor, legal fees and land transfer taxes to purchase a different home, he says. According to historical data, more than 80% of homeowners 55 or older choose to age in place. According to CMHC’s Renovation Report of September 2016, southwestern Ontario (areas such as Windsor) will have the biggest potential for renovation spending, while the GTA, where there will be modest job growth, lesser affordability and a younger population than the provincial median age, will have the least potential. Rental demand will also continue to grow, predicts Tsiakopoulos, particularly among 25- to 44-year-olds, who will find it increasingly challenging to buy a home. “This bodes well for new investment in that sector, as the pool of potential renters is growing and there is not the same stigma about renting that there used to be a generation ago,” he says. Immigration is also driving the rental market, as two-thirds of all immigrants coming to Canada—including international students—move into rental immediately. But the new government mortgage rules and affordability challenge might actually present another opportunity for builders: as lenders. There’s little doubt that new home builders will feel the pain as sales slow in 2017 and housing supply continues to be a problem. But there is still ample opportunity in the three Rs or for builders willing to be creative. That could mean getting into the financing business, as Campbell suggests, or offering lower-priced products to first-time buyers who now qualify for smaller mortgages. 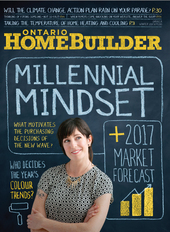 With about 4 million in Canada, or 27% of the population, millennials represent the home building industry’s next big opportunity. There are 1.5 million of them in the Toronto area alone. But many in this 19- to 34-year-old age group aren’t in any rush to buy a home, due to affordability and lifestyle factors. And their priorities and values are much different than their elders’. While their parents, many of them immigrants who came to Canada seeking a better life, believed that hard work, endurance and getting ahead was important, their kids have a different mindset, says James McKellar, professor of real estate and infrastructure at the Schulich School of Business at York University. Many millennials are well educated and will enjoy good employment prospects and they’ll gravitate to Toronto or other large urban centres where the majority of knowledge-based jobs are. They value being able to work and play close to where they live and realize they will likely change jobs several times during their working life. The car holds little fascination for this group, who would rather use public transit than deal with traffic congestion. And they are well attuned to the shared economy (where services such as Uber have become popular), says McKellar. They don’t see a need to own a car and they don’t want the expense. That’s why urban locations or close to transit lines are their resounding choice. And they’ll gravitate towards condos or rentals because of affordability, walkability and the proximity to transit. That’s why most will choose to buy a downtown condo or rent an apartment—at least once they move out from under mom and dad’s roof. According to Don Campbell, senior analyst for the Rein Estate Investment Network, 52% of people aged 20 to 29 in Canada are still living at home with their parents. Young single women are more inclined to move into a place of their own than young men, says McKellar, and they like downtown condo living for proximity to their jobs and friends and the safety a building with security offers. Urban neighbourhoods are also popular because millennials value face-to-face contact—that’s why coffee shops have become so popular. They also value experiences such as shopping at local markets, says McKellar. If they are going to buy property outside of the urban centre, it will be on a transit line, in places such as Vaughan (where a new subway link will open soon), or Kitchener or Guelph, where GO service will be extended, says Campbell, or in Durham Region, where the 407 extension has made commuting easier. But millennials will stay renters much longer than the previous generation, says Campbell, and the new mortgage rules will further delay any buying plans they have. Many will stay in the city. McKellar says condos are still relatively affordable and in good supply (the average Toronto area condo price was $415,643 in September 2016, according to Toronto Real Estate Board stats). Many millennials will remain renters. McKellar notes the resurgence of new purpose-built rental buildings, many offering the same type of amenities as condominiums. And those sorts of attributes are critical, says Campbell, as millennials have far more discriminating tastes than their parents. They want a high standard of finishes, nice amenities and high-speed internet and wireless networks. 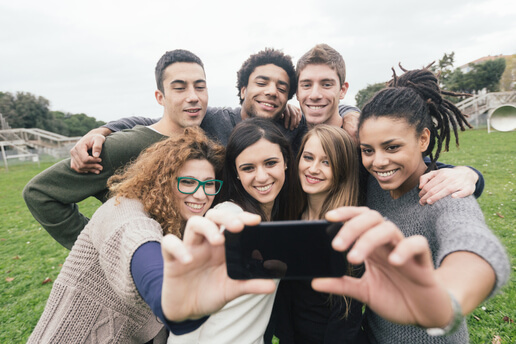 Millennials make their spending decisions based on what they see online or through social media and their use of YouTube, Instagram, Twitter and Snapchat is growing. These types of millennials are what McKellar calls the “haves”. There is a divide between those who are well educated and those who are not, who tend to fill low-paying service jobs. “The unfortunate part of the story is that people without education struggle in this new environment and can’t afford to live downtown,” he says. “They live further away where rents are more affordable, buy an old car and have long commutes. If the city and province don’t wake up to this fact, we’re not going to have a city.